FORCED, as it’s listed in block caps in my Steam library, isn’t just another ARPG or dungeon crawling hacking and slashing click-fest as you might first assume. 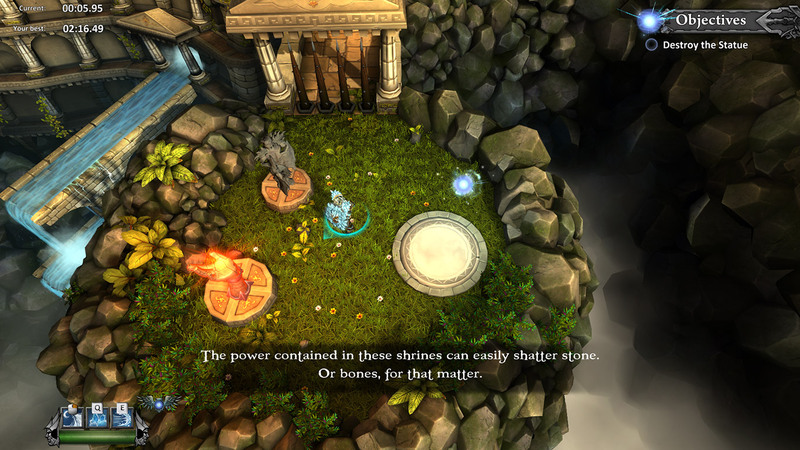 In a nutshell FORCED cleverly combines the puzzle-y goodness and seductive challenges of Lara Croft and the Guardian of Light, the less-is-more customisation and twitchier targeting-based combat of Bastion, and the kind of frantic survival co-op madness reminiscent of Magicka and Alien Swarm. I love that it has no loot to tediously sift through and sell, no inventory Tetris — hell, no inventory — no experience points, no leveling, no grinding, no unwieldy hotbars chock-full of timers and symbols, no woefully unsatisfying stat increases like +1% chance to critical or +5% resistance to fire damage, no specialisation that irritatingly locks you in for the rest of the game, no convoluted skill trees, no mind numbingly inevitable dungeons, no quest drudgery and the typically awful (and pointless) dialogue accompanying them, no long-winded time wasting story that takes itself too seriously — FORCED just lets you get straight down to what matters: the trials and working out how best to conquer them. While it’s certainly possible to play FORCED alone, it’s a far more rewarding experience when you’re playing with others, preferably friends, iterating on and discussing strategies as you play. I had the pleasure of playing with Steerpike, Brandon, Max and my girlfriend’s brother Luke over several sessions in various configurations and I found it scales well from two to three to four players. 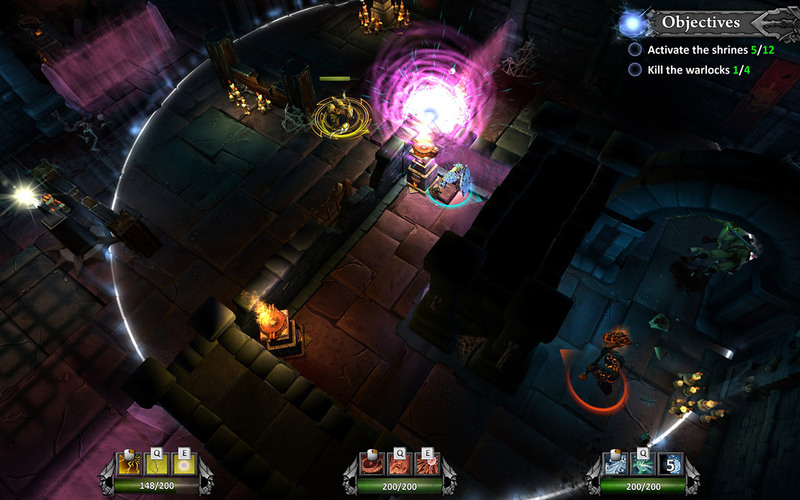 FORCED also comes with configurable pad, mouse and keyboard support as well as allowing local multiplayer with online play — an uncommon but welcome feature. Whether you’re playing online or locally, players share the screen, this FORCES you to stick together (that’s the only pun, promise). Most of us played on pad and it worked admirably, although a few abilities where you have to place an area marker are quite tricky to target with a pad and seemed more cut out for mouse. FORCED employs a WASD/twin-stick control scheme with strafing and targeting but no jumping or rolling. 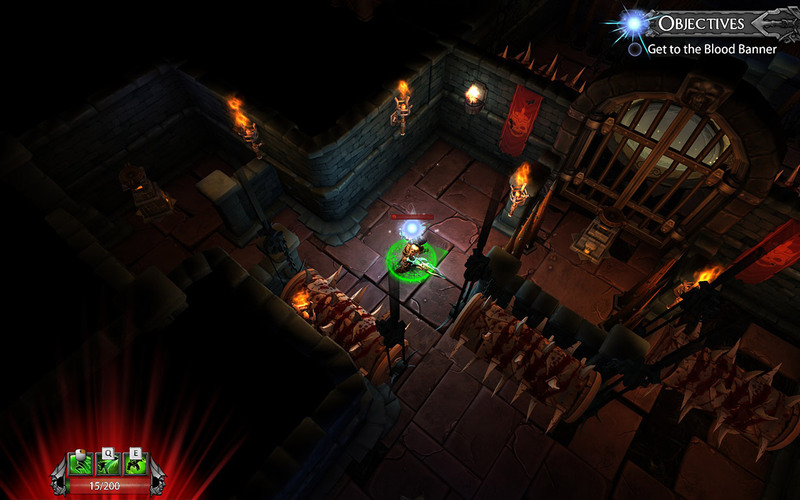 All enemy attacks however, can be evaded with clever use of abilities and standard movement. You start FORCED wearing nothing but a loincloth having been cast into a deep hole to survive a series of deadly trials you’ve trained your whole life for. Naturally, no one has ever made it. You and your kin are essentially bred for the amusement of the gods, the cruel arena masters you will inevitably come face to face with as you run the gauntlet they have set before you. Down there you meet Balfus, the Spirit Mentor, a glowing orb who not only helps drive the story and guide you through the trials, he also forms what I would consider the defining and arguably most compelling mechanic of the game, and crucially what makes measured play and actual honest-to-god teamwork so important. On a side note, the voice acting for Balfus is… odd. His personality seems to shift subtly from one moment to the next: grand and noble then sharp and snappy then laid back and weirdly sultry — it’s kooky and kind of works. The voice acting for the other characters is the usual over-the-top fantasy fare but the cutscenes are relatively short and don’t tend to outstay their welcome. Anyway, Balfus can be ordered to follow a player or to travel in a straight line to where he was summoned. With careful planning his trajectory can be used to activate or disable different structures or shrines that create different effects, such as shockwave stuns, speed boosts, defensive electrical zaps, imbuing the orb with an explosive charge or retracting deadly crippling mists. Orb healing involves passing Balfus over a fountain which surrounds him with a healing radius that gets smaller and smaller over time so patching you and your allies up takes a concerted effort. I initially thought the orb mechanic was a bit gimmicky, indeed I think we all did, but as we played more we started to realise just how downright clever it is. At first we clumsily fought over control for Balfus, wasting time pulling him here and there, but eventually we had to get our act together and say ‘Right, Brandon can do the summoning, we’ll deal with the enemies.’ Sometimes we’d have to chain summons together to activate various shrines in quick succession or disable enemy spawners which involved decisive action. Before each trial there’s a preparation room where each player can choose their character and select their skills. Each character can have a maximum of three main abilities and three ‘passive’ abilities equipped, and these can be selected from their respective skill pools. There are four characters in total: an ice character carrying a throwable frost shield (tanky and resilient), a venom green rogue with twin blades (fast and evasive), a molten hammer wielder (slow and powerful) and an electric yellow archer (high risk high reward ranged character). In the preparation room players can switch characters and reconfigure their skills at will so there’s plenty of room to experiment and get a feel and taste for each playstyle. Skills are varied, ranging from charged magmatic hammer blows and chain lightning arrow strikes to Dark Messiah-style super kicks and stunning ground slams. Skills are unlocked by acquiring crystals, and crystals are acquired by completing trials. Each trial can bag you three crystals, one for standard completion, one for completing a specific challenge and one for completing the trial within an allotted time. The more crystals you get the more skills you unlock, and the more skills you unlock the more you can tailor the way you play with each character and with your teammates, potentially making certain trials and challenges easier. Trials are unlocked in batches but can be done in any order once unlocked so there’s always something to be chipping away at to get you more crystals if you hit a wall. One thing we all liked was that gaining crystals unlocks skills across all characters, rather than just for the character you’ve been playing with. This means you’re free to mix things up and choose who you want, when you want, rather than being entrenched or committed to a particular character because you’ve not played with any of the others. It’s fantastic, and, again, allows everyone to get a feel for each character’s playstyle. FORCED has a particularly smooth learning curve that starts with a short, sweet and relatively hands-off tutorial (see video here) introducing you to the most basic skills you’ll need to tackle the first trial. From there, each trial steadily layers on new mechanics and dynamics revolving around Balfus that you’ll need to master in order to complete challenges and grab as many crystals as possible. The flow and pacing of the game is pitch perfect which is why I’m a big fan of the way the game determines the multiplayer campaign progress by the player with the lowest crystal count and what trials they’ve completed. This system prevents players from being dumped into trials they haven’t progressed to yet, missing out on content — and perhaps most importantly — missing out on vital parts of the learning curve. It’s a great way of ensuring everyone experiences and understands the game as it was intended. Some of the puzzles and challenges had us stumped a few times and the solutions were very much of the ‘Ahhh!’ rather than the ‘Wait, what?’ or ‘Uh, okay’ variety. Brandon was almost always one step ahead of us though. He was the brains, we were the prawn. That’s not a typo. This is all to say that the challenges are terrific and surprisingly varied. One required us to kill a particular enemy in under 7 seconds (much trickier than it sounds, and remember, the difficulty scales with each player), another required us to stun or kill multiple enemies using Balfus, another required us to move Balfus less than 10 times (this was particularly tricky and fun, and demanded some very careful use of the orb) and some required us to avoid certain hazards or reach a specific goal. 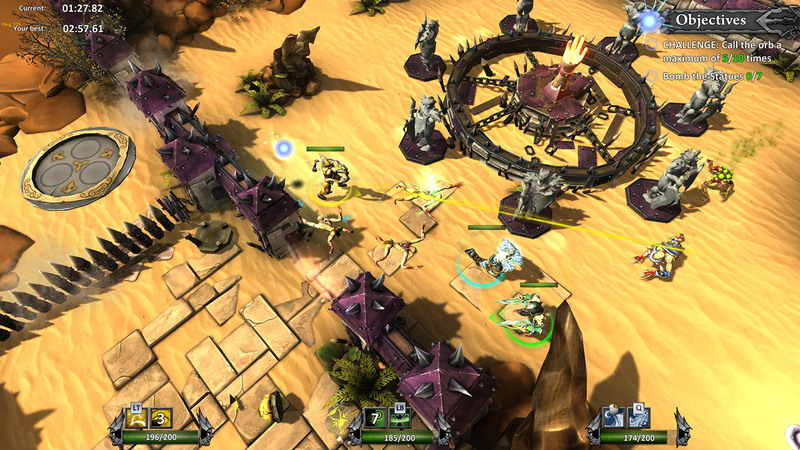 The combat in FORCED revolves around ‘marks’. Almost every attack applies a mark on an enemy with some abilities ‘mark appliers’ applying marks in much quicker succession. A maximum of five marks can be applied to any given enemy and certain abilities known as ‘mark spenders’ spend those marks, usually increasing the efficacy of the ability for every mark spent. Marks are essentially multipliers so the more you stack on to more enemies the more your team’s abilities will shine; increased damage, larger areas of effects, longer effect durations, greater knockbacks etc. Some abilities however, excel when enemies have no marks on them so there’s more to the game than spamming marks and spending them (although that certainly works). 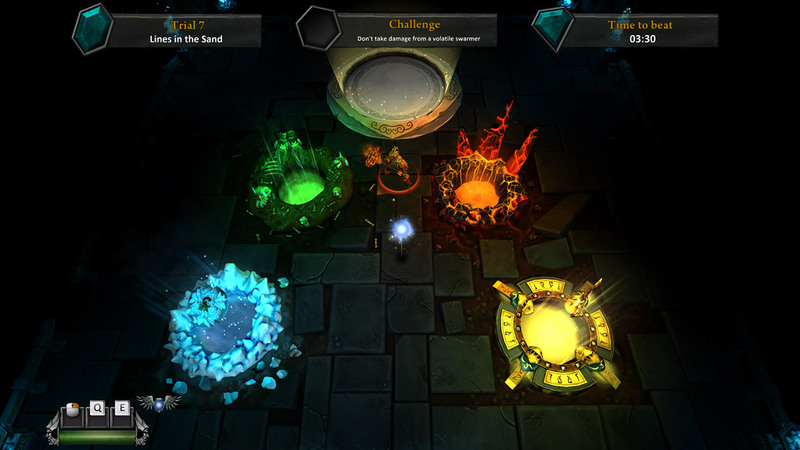 The first challenge for example requires you to take out a boss in less than 7 seconds. I can’t remember whether it was all of us or just Max and I, but we focused purely on mark applying and spending but it was when we switched a single passive skill to deal more mark-free damage that we really hit it hard. Presumably we were spending marks so quickly we needed some extra damage in between applications. Either way, I found that there was a time and place for most abilities, in fact, certain challenges required a degree of experimentation to get that edge to just nick a victory. You can’t just veg out and cruise through FORCED, it’s very much a game where you have to consider your skills and how they can be combined for certain situations and challenges. Collision detection on enemies and allies means you can’t walk through mobs (and they can’t walk through each other either) so it’s easy to get swarmed (the fodder enemy is, in fact, called a ‘swarmer’). This dynamic makes the abilities with knockback extremely important considerations. 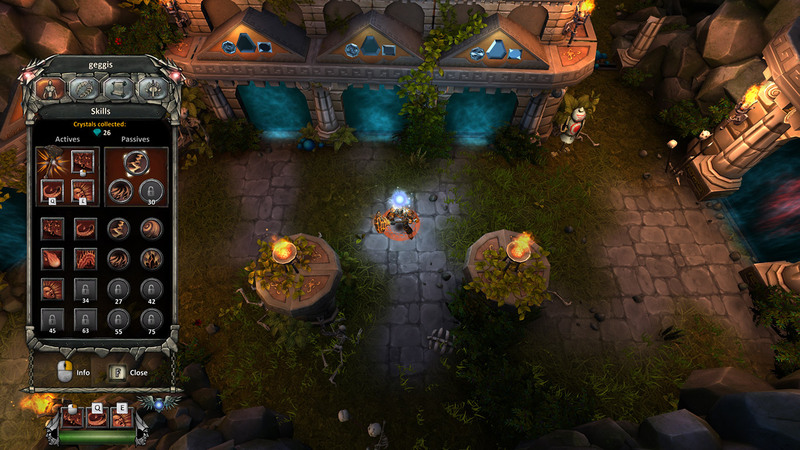 Each player’s abilities (including cooldowns) and health can also be seen at the bottom of the screen so coupled with the fewer active abilities it’s easier to read situations and coordinate attacks. Explode-y physics make those killer blows all the more satisfying with limb kibbles, armour fragments and weapons flying everywhere. Gibbing is very much a thing here. I’m also a fan of the way FORCED uses modest numbers. It’s not uncommon to see damage indicators as low as 1 and 2 popping up, while higher damage output is often around 50+. It makes a refreshing change to the likes of 14,034 and 9999 (! !1) per hit, numbers which always seem unnecessarily unwieldy and artificially inflated to me, as if anything lower wouldn’t sustain interest or arouse the proverbial epeen. There’s no over compensating here. We also heard the Wilhelm Scream sneaking into FORCED a few times (1:25 in the trailer above for example), and the theme tune I’ve got a bit of a soft spot for. 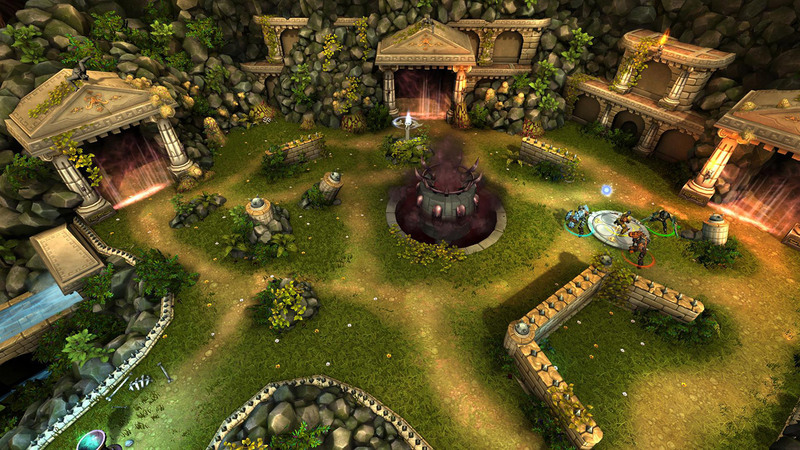 To top it off, FORCED comes with a couple of survival arenas that are tough, tough, tough and tough. You need a certain number of crystals to access each but they’re a welcome addition and diversion from the campaign. Here‘s a great video showing just how chaotic the first arena can be with friends. Gripes? Some of the menus were a little unusual to navigate with a pad and I had difficulty using the ‘invite friends’ function when hosting a game so Steerpike, Max, Brandon and Luke had to find my game in a list to join. No biggie though. 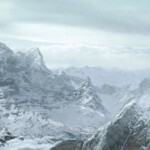 And despite multiplayer apparently operating over peer-to-peer, no lag or connection issues were reported despite me hosting in the UK and Steerpike, Max and Brandon connecting from the other side of the Atlantic. Having said this, I do have a bitchin’ 72 Mbps connection now. There was the odd hiccup with our total crystal counts being lower than expected every now and then but nothing a quick restart didn’t sort out. I’d very much like to see whatever custom controls you’ve set-up be reflected in the game too because if you’re not rolling with the default control scheme some of the on-screen prompts and pointers can be incorrect and misleading. All in all though it was a really solid and stable experience, more so than other stalwarts I’ve played over the years. Perhaps the biggest problem with the game is that it’s not nearly as interesting to play on your own — grab some friends and a four-pack if you can. On the whole, we were all pleasantly surprised and impressed with FORCED. We came in expecting a game along the lines of Torchlight but got something entirely different, refreshingly unique and sharply focused. I think it’s one of the best co-op games I’ve played over the last few years and I really can’t fault it for putting teamwork, experimentation and thoughtful proactive play at the front of the experience. To quote Brandon: ‘I think we all initially sort of scoffed at Balfus as a bit of a gimmick’, but he’s arguably the star of the show (Balfus that is, not Brandon, although Brandon was pretty twinkly too), binding players together and really underlining the importance of cooperation. When you throw all the varied trials, challenges and puzzles in there as well as the enemies, the different shrines to activate, the slick and satisfying combat, the character classes and the skill pools to dive into and play around with, you’ve got a game that’s unlike anything else out there. 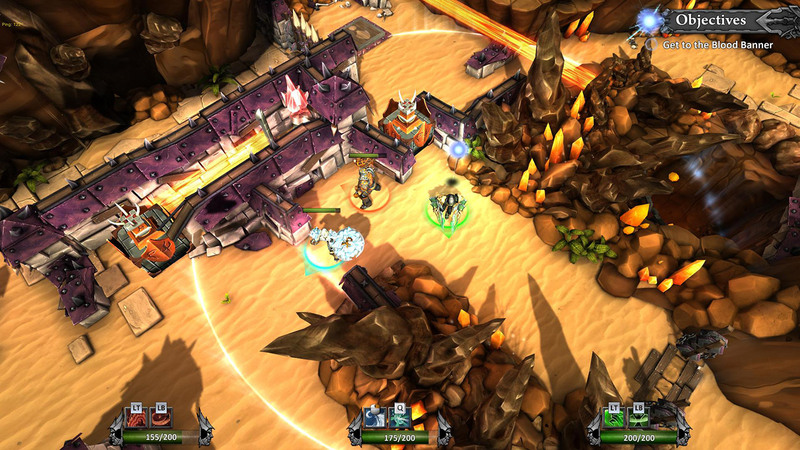 BetaDwarf describe FORCED as ‘tactical arena co-op’ or ‘co-operative gladiator action’; whatever it is, it’s brilliant and absolutely worth your time and money if you’ve got a few budding buddies. FORCED is available on Steam and from The Humble Store. Great impressions Gregg. When I was originally contacted by Beta Dwarf, I hadn’t heard of FORCED. Honestly, a few minutes of research didn’t impress me – not in the sense that it seemed particularly bad, it just didn’t seem particularly interesting in a world with Path of Exile and so many other Diablastion (yes I invented that word and it is awesome) style multiplay options. Not until we all sat down to actually play FORCED did its quality and uniqueness really shine through. And this is a high quality, unique game with plenty in its favor. 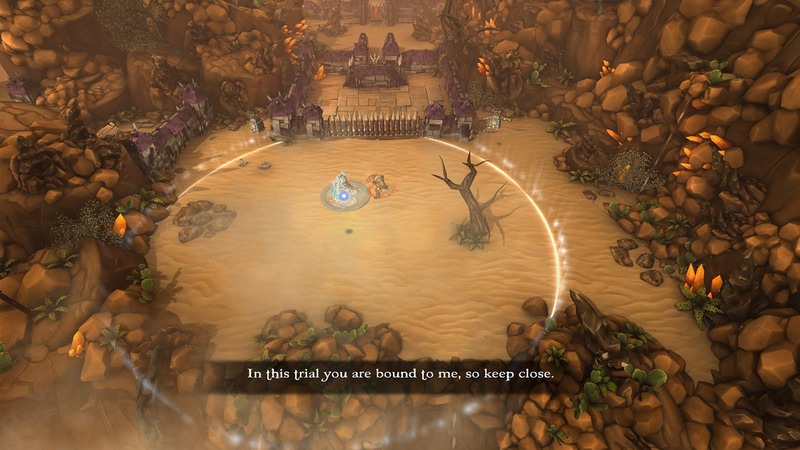 All aspects of gameplay, from Balfus to the general arena puzzle solving, feel clever and original. The puzzles can be fiendishly challenging, combat has a satisfying thunk, and each character is worth exploring in their own right. Beta Dwarf was a student group now gone professional, and I was also impressed with the sense of polish and game design nuance that went into most aspects of FORCED. Balancing, leveling, multiple challenges per map… it spoke of a game designed by people who actually know how to design games, something that usually comes from years of experience, but evidently can also be taught. During our first play session, we all spent about three hours just commenting on and off about this and that – it’s impressive they have this, I like how they did that, really good decision to include the other, etc. In a way I think we were all surprised, not that the game was good (it’s moved over 100,000 units, which in indie début terms is highly impressive), but that it was so polished, clever, original, and fun. Little things to big, Beta Dwarf really nailed this, and I’m eager to see what they do next. I also appreciate your restraint in commentary on the value of my contributions to the effort. Steerpike the Premature Balfus Summoner; Steerpike the What Are You Doing Over There; Steerpike the NO JESUS IT’S GOING TO EXPLODE… these are my nicknames. I hang my head in shame. Honestly I see myself as an important equalizer for the team. Somebody needed to counterbalance Brandon’s mad Balfus wrangling skills with sheer ineptitude! I think you’ve covered everything we could have hoped to say as a group, Gregg. Your impressions (review sized, they are!) nail how my experience was. I can’t wait to dive deeper into that arena survival mode a bit more as well. Though a bit ordinary looking on the surface Forced has some really nice tricks up its sleeve. FORCED does sound like a fun time if you have a few friends along for the ride. Thanks for taking the time to do a write up on it. Yeah this was meant to be a chat between me, Steerpike, Max and Brandon, but getting together to play the game was tough enough in itself, never mind scheduling a meeting on the run up to Christmas to discuss it! I had a lot of notes lying around after our first few sessions so it seemed only right to organise them into an article! Thanks for the comments!